Mostly clear. Low near 55F. Winds SSE at 10 to 15 mph..
Horatio pitcher Wade Beasley is now a professional. Beasley, who had signed a letter of intent with the University of Arkansas, chose the professional track instead. Beasley signed a contract with the Milwaukee Brewers July 3. He is currently at the Brewers’ training facility in Phoenix, Ariz.
Beasely will spend the summer training in Arizona. “He will be there through the end of August. He’ll come home for a couple of weeks then go back,” Mrs. Beasley explained. 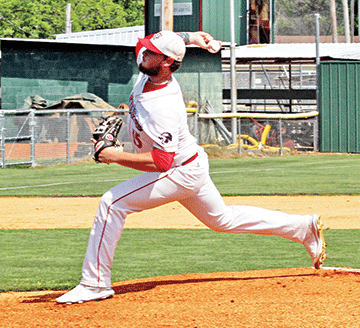 Horatio baseball coach Lance Spigner pointed out that Beasley broke new ground for the Lions. “This is the first one we’ve had to get drafted,” Spigner said. “He took a lot of time with his family and advisers deciding whether to go to the U of A or sign with the Brewers. It was a tough decision. I know he really liked the university. According to brewcrewball.com which tracks the players drafted by the Brewers, Beasley was drafted in the 24th round, the 275th player taken. He received a signing bonus of $257,500.